Here's everything you need to know about Apple Pay, including how to use it on your iPhone, iPad, Apple Watch, and Mac, and what stores and apps accept it. Apple Pay—the company’s flagship mobile payment platform—has grown at a breathtaking rate since its introduction in 2015. Apple Pay transactions continue to rise, and more banks, retailers, and countries continue to join. You can even use Apple Pay to complete web transactions via Safari, too. 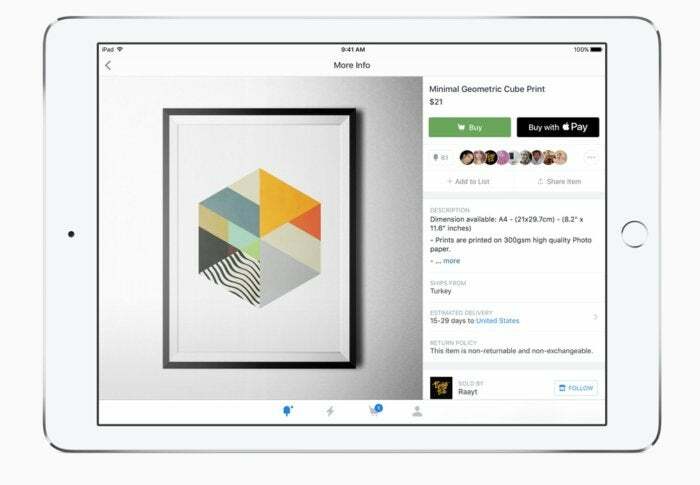 You can even use Apple Pay for peer-to-peer payment transactions—similar to Venmo and Square Cash—through an iOS 11 update that introduces Apple Pay Cash. With all of these Apple Pay options, it’s high time you jump on the mobile payment bandwagon if you’re not there already. 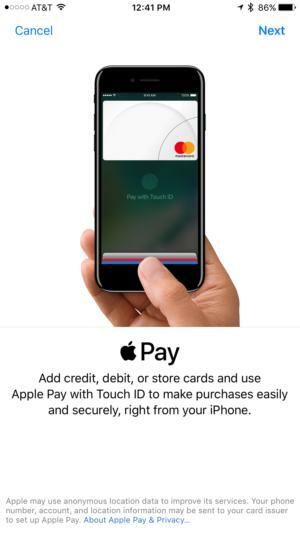 Read on to learn more about how Apple Pay works, how to get your iPhone, Apple Watch, and Mac ready for it, and most importantly, where you can go use it. 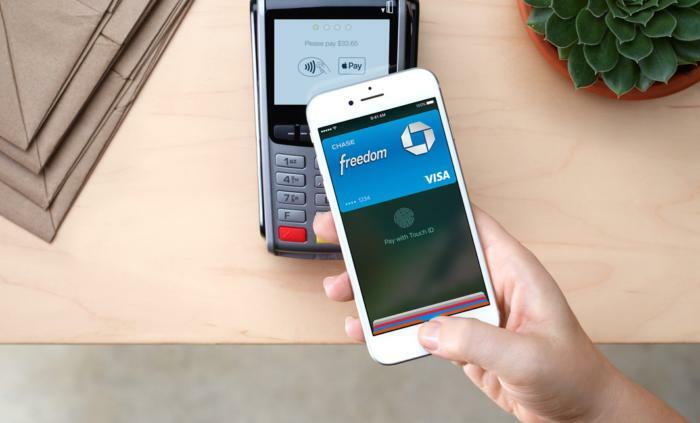 Updated 01/22/19: Apple has announced that Apple Pay will soon be accepted at Target, Taco Bell, Hy-Vee supermarkets in the Midwest, Speedway convenience stores, and Jack in the Box. These are the only iPhones equipped with the requisite NFC radio antennae. Besides NFC compatibility, the other piece of the hardware puzzle is Face ID/Touch ID. You’ll also need to update your iPhone to iOS 8.1 or later, which will turn on your phone’s Apple Pay feature. To check which version of iOS you’re running, go to Settings > General > Software Update. Once your iPhone is in order, you’ll need to link credit or debit card to use for payments. If you already have a card linked to your Apple ID for making iTunes and App Store purchases, you can opt to keep using that card with Apple Pay—you’ll just have to re-enter the card’s security code so Apple knows you’re legit. Take note: Some banks will add an extra layer of security to this step, asking you to enter a code they send to you via text, so that they too know you’re on the up-and-up. You can also add different cards—just launch Wallet and tap + in the top-right corner. You’ll then be prompted to add either a credit or debit card to use with Apple Pay or another pass to store in Wallet. Tap Add Another Card, then follow the entry fields on the next screen. You can speed this up by taking a picture of your card with your iPhone. Whether you’re using the card already linked to your Apple ID or adding a new one, your iPhone will guide you through the setup process, which includes verifying your card, granting Apple Pay access, and then storing it in Wallet. Be sure to have your card handy so you can verify the card with its security code. The card linked to your Apple ID will be listed as your default Apple Pay card, but you can always change that by going to Settings > Wallet & Apple Pay and updating your transaction default information—or do it in-app by selecting your default card, choosing the “information” button on the lower right-hand side of the screen, and changing the details from there. You can also tweak your transaction settings (like your shipping and billing addresses), allow Apple Pay payments from your Mac (more on that in a bit), and allow you to start an Apple Pay transaction by double-pressing the Home button (or double-pressing the Side button on the iPhone X), all from Settings. To set up Apple Pay on your Apple Watch, you’ll use the Apple Watch app for iPhone. In the My Watch tab, scroll down to Wallet & Apple Pay. In that section, you can mirror the alerts that show on your iPhone, or choose Custom and elect to have alerts come to your watch or not. If you are already using Apple Pay on your iPhone, your cards should automatically sync up to use with your Apple Watch. If not, you can add cards again much like you would from Wallet, just follow your iPhone’s prompts. Once you’re set up, you can find your debit/credit cards in the Wallet app on the watch, but it’s much faster to use the shortcut. Just double-press the button underneath the Digital Crown, the same button you press once for the Friends ring and Digital Touch feature. Pressing twice will bring up your default Apple Pay card, with your other cards available too if you’d like to select a different one (just swipe left or right). If your Mac is running macOS Sierra or High Sierra, you can use Apple Pay to complete online purchases via Safari. However, unless you have a new MacBook Pro with Touch Bar and Touch ID, you can’t just use Safari alone—you’ll need to use an Apple Pay-compatible iPhone or iPad (running iOS 10 or later) or Apple Watch (running watchOS 3 or later) to verify any transactions. You’ll also have to use the same iCloud account across devices. 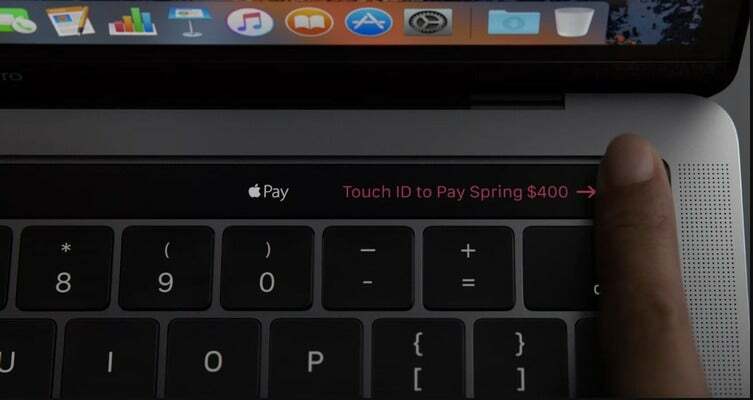 If you have a MacBook Pro with Touch Bar, you can use Touch ID to check out with Apple Pay. For iPhone or iPad verification, use your device’s Face ID/Touch ID to verify your fingerprint. You’ll be guided by an on-screen dialogue box. For Apple Watch verification, double-tap the side button underneath the Digital Crown. Your watch will display the total amount. Once verified, you’ll see a purchase confirmation on your Mac’s screen. If you’re using a Touch Bar MacBook Pro, make sure Touch ID is turned on—tap the Apple Pay icon on the Touch Bar to start the process. What online stores actually support Apple Pay payments, you may ask? Apple has a full list on their website. When buying something at a brick-and-mortar store, you’ll hold your iPhone up to a wireless payment terminal near the cash register, and then use Face ID/Touch ID to complete your purchase. These sensors are the same ones you’ve already seen in stores, often equipped with both card swipers and a tap-to-pay contactless terminal. The beauty of Apple Pay is that you don’t even need to wake up your device or launch Wallet—your phone wakes up automatically when it gets in range of the terminal and initiates the payment process. The easiest way to make a purchase with a modern iPhone (one with Face ID and no Home button) is to double-tap the side button while looking at your phone. This will wake it up and launch Wallet, while authorizing you with Face ID. Then simply tap your iPhone to the terminal to complete the purchase. If you’re buying something with your Apple Watch, double-press the button underneath the Digital Crown. Pressing twice will bring up your default Apple Pay card, with your other cards available too if you’d like to select a different one. Once you pick the card you want to use, you’ll just hold your Watch close to the contactless payment terminal until you hear a beep and/or feel a vibration. It helps if you turn the Watch face toward the payment terminal, almost smooshing them together like they’re kissing. So you typically can’t see the watch’s face while the payment is happening, unlike when using Apple Pay on an iPhone, where the screen is typically facing you. Depending on the retailer, the card you’re using, and the value of your purchase, you might need to enter your PIN. And even though credit card companies are either phasing out or no longer require customers to provide a signature to complete the transaction, the store itself may want your signature. If you’re buying something through a partnered online store or app on your iPhone or iPad, you’ll just use Face ID/Touch ID to complete the purchase. 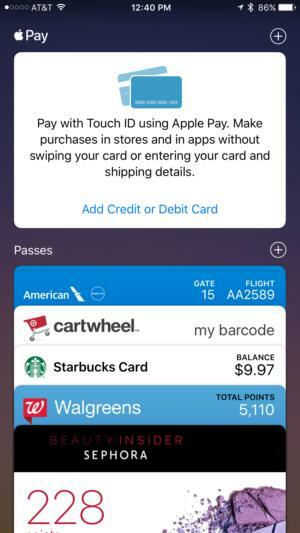 Depending on the app, you may have to toggle on a setting to allow the app to access Apple Pay, or to set Apple Pay as your default method of payment. For the Mac, use your Touch Bar and Touch ID sensor, or use your paired secondary device (your Apple Pay-compatible iPhone, iPad, or Apple Watch, as outlined in the section above) to complete transactions. Make sure all your devices are connected to the same iCloud account. What makes Apple Pay such a game-changer is how many retail partners the platform has, with new stores being added constantly. Besides the Apple Store, you can use Apple Pay at several brick-and-mortar locations, which Apple outlines here. 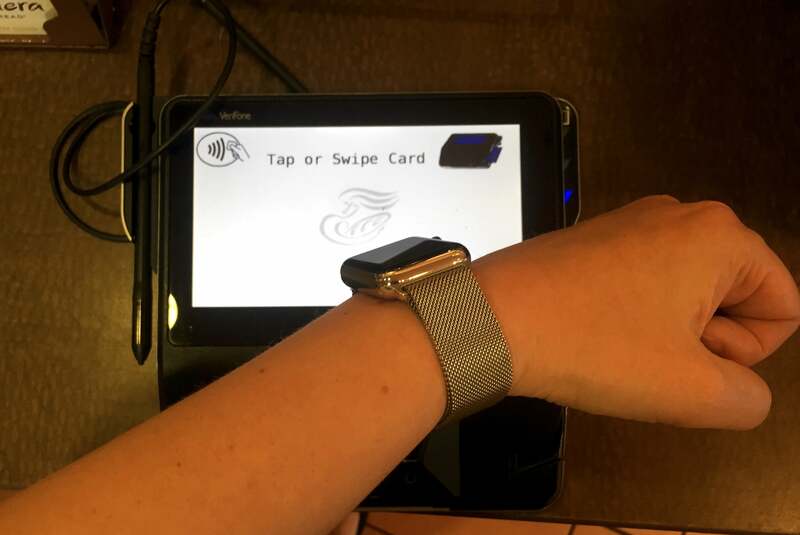 Early in 2019, Apple Pay was added to Target, Taco Bell, Hy-Vee supermarkets, Speedway convenience stores, and Jack in the Box. These retailers and restaraunts follow some important additions throughout 2018, including Costco and 7-Eleven. With this latest expansion of retailers, Apple says, it is now accepted at 74 of the top 100 merchants in the U.S.
Apple Pay is supported by a plethora of U.S. banks, credit unions, and credit card companies. For a complete list of banks and financial institutions that support the service, check here. Traveling abroad? Not a problem. Apple Pay is accepted in several countries and jurisdictions around the world—including the U.K., Australia, Japan, China, France, Spain, and Italy. Check out the full list here. Apple Pay Cash is a new feature that allows you to send money to another iOS user. It’s similar to Venmo, PayPal, or Square Cash. 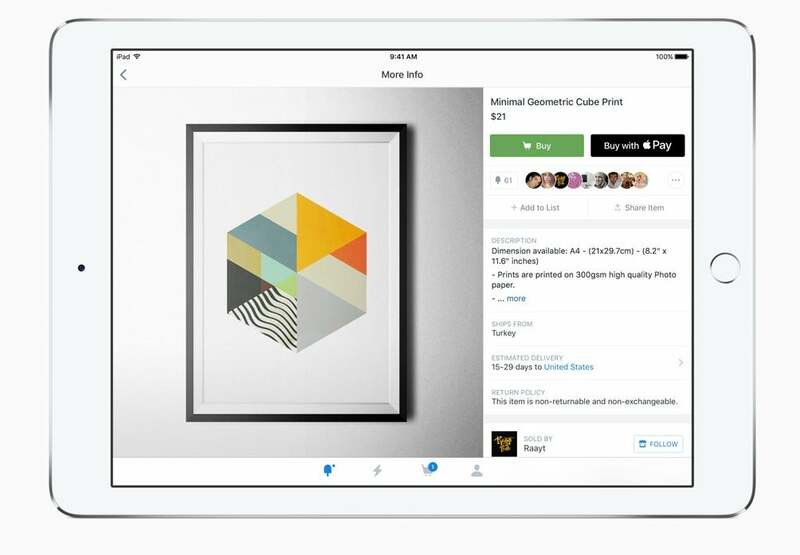 It’s not a new app that you need to download; it works within iMessage and the Messages app. Two-factor authentication for your Apple ID. An eligible credit or debit card in Wallet, so you can send money. Read our Apple Pay Cash guide for all the information you need on how to use Apple Pay Cash, how it works, and more. According to a report by The Wall Street Journal, Apple and Goldman Sachs Group are going to have a Apple Pay credit card available early in 2019. Details on what benefits the new credit card will offer have not been revealed, but the new card will replace the one Apple currently offers in partnership with Barclays. 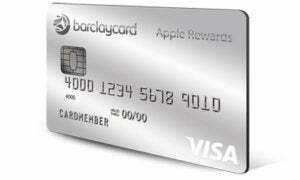 The Barclays Apple Rewards Visa offers special financing on Apple products, points for money spent at the Apple store, restaurants, and other venues, and $25 Apple Store/iTunes gift card rewards for every 2,500 points earned. This story, "Apple Pay FAQ: Now accepted at 74 of the top 100 U.S. merchants, including Target and Taco Bell" was originally published by Macworld.